Science Project _ Does the wattage of a light bulb affect the amount of heat given off? 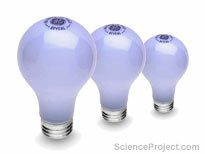 Light bulbs are available in many different sizes, wattage and styles. Almost all light bulbs get hot, some more and some less. Heat of light bulb may be high enough to cause fire. A piece of paper or cotton cloth next to a hot light bulb is a recipe for disaster. Heat of light bulbs are often high enough to be used as heat source. Do all light bulbs produce the same amount of heat? Does the size of light bulb affect the heat it produces? Does the wattage of a light bulb affect the heat it produces? These are all possible questions that may be studied. In this project you will study the effect of wattage on the heat a light bulb produce. In this project you will compare the heat production in light bulbs with different wattage. Material for your experiments may be found at home or purchased locally. Support or more details on this project is available for the members of ScienceProject.com. The experiments of this project can be completed in one day. You may use your results to make a data table or draw a graph.